Mazars Grange player/coach John Blain was delighted to see four of the club’s up-and-coming young stars named in the Scotland under-19 squad this week – and he believes there are plenty more coming through the ranks in Stockbridge. Tomorrow afternoon the CSL Eastern Premiership leaders take the trip across Edinburgh to face Watsonians and it is likely that Fin McCreath and Haris Aslam will be involved in the XI. The duo, along with Cameron Sloman and Simon Whait, will next month be heading off to Jersey with the national age-grade side, where they will take on the hosts, Ireland and the Netherlands in Pepsi ICC under-19 Division 1. With most schools breaking up around now for the holidays Blain, who himself works at Loretto School, is hopeful of being able to spend more time in the nets with the quartet and the even younger players involved at Grange in the coming weeks. He is also keen to expose more of them to senior cricket and with three XIs – competing in the top flight, the Baillie Gifford ESCA Championship and East Four – playing each Saturday he can do just that. 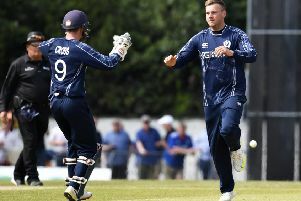 “When I came to the club I was tasked with trying to help the young players along and I am really enjoying that challenge,” former Scotland bowler Blain said. “In the early part of the season we don’t see as much of them as we would like because they have school exams and school cricket commitments, but hopefully from July onwards they will be around regularly. “For the other young players it is great to see Fin, Haris, Cameron and Simon being picked for the Scotland under-19s and it gives them something to aim for. After a superb start to the summer – 12 wins on the spin in all competitions – Grange did not excel last week. They lost out to Watsonians in the Murgitroyd Masterton semi-final ten days ago and then were defeated by Falkland at the weekend in the league. However, both matches were played without opening batsmen George Munsey and Caiden Lang, involved and the duo should be back tomorrow. And, ahead of a weekend that also sees Grange play a Scottish Cup last eight tie with Stoneywood-Dyce on Sunday, Blain added: “The guys have played some great cricket this season and the recent defeats don’t make us a bad team overnight. ‘Sonians lost at home to Carlton last weekend and are second bottom of the table, but will take heart from the recent T20 victory over Grange. Elsewhere in the top flight, tomorrow second placed Carlton take on third placed Arbroath in what should be a cracker at Grange Loan. Carlton’s senior first XI have been in good recent form and last Sunday the club’s young players showed that they are ones to watch when they won the Scottish section of the NatWest Club Championship, defeating Grange in the final at Inverleith. Meanwhile, RH Corstorphine host Stoneywood-Dyce and Heriot’s are at Autoecosse Forfarshire tomorrow. In the Baillie Gifford ESCA Championship there is a tasty match up with second placed Carlton II travelling to take on Mazars Grange II. Stuart&Stuart Penicuik face a tricky trip to take on unbeaten leaders Glenrothes, while SMRH host Edinburgh. In East One Watsonians II take on Heriot’s II.